This is the sequel to my last post about a pilgrimage I’m experiencing in Kenya and Rwanda. Yesterday we left Nairobi very early and flew to Kigali (with a quick stop in Burundi!). After a visit at a local United Nations High Commissioner for Refugees (UNHCR) office, we departed for Gihembe Refugee Camp. I really wish I could have taken some photos there to share with you, dear reader, what this place looks like. The Rwandan government does not allow photographs except by those with permits, and only two staffers in our group had the permits. Since I don’t have photos to share, you’ll have to make do with words (except for one photo I cribbed from flickr). And yet, no one has chosen to live there. The thousands of people who live in this camp are displaced from strife-ridden areas of nearby Democratic Republic of Congo. Everyone I spoke with came in the first wave of about 1997. They’ve been living in “temporary” shelter for nearly twenty years. Can you imagine? I get annoyed when I can’t pin down some result in a day or two. For nearly twenty years, these refugees have been in limbo. It’s not safe (still!) to go home. They can’t get papers to settle in Rwanda. And they are all waiting for some other nation to take them in as permanent residents or citizens. As I understand it, only about one percent of refugees will be resettled. The rest wait, and wait, and wait. A few of us pilgrims were able to visit two shelters. (They are not called “homes”, rightly so.) The occupants met us graciously and invited us in. These are small structures with only a door and no windows. The roof is, if they’re lucky, corrugated metal. Most roofs are plastic sheets. There is no electrical lighting. To see at night, they must been oil lamps. Water is carried from nearby wells (insufficient quantities to be considered a healthy amount). Cooking is done many meters away. Each shelter houses an entire family, perhaps nine people or a few less. We asked one man what his hopes are. “I have been living here seventeen years. I have no hope any more.” This has to be one of the hardest things to hear from a fellow human’s mouth. No hope. When we pressed him a bit more about whether he would like to join his parents, who have been resettled to the United States, he said he would like to live near them, but his tone of voice told us he did not believe this would ever happen. No hope. What has unfolded here and elsewhere around the world is a moral disaster. Unlike a natural disaster, in which we respond (or not) to something beyond our control, this is a situation of human making. Nations like the United States have failed to respond to the fundamental situations that create refugees, we have not taken as many refugees as we might, and we have under-funded those who care for refugees. It is true, I should note, that the United States takes more refugees than any other nation. We should be proud of this, but not complacent. Whereas we have taken as many as 120,000 persons per year in the recent past, we now receive about 70,000 refugees a year. It’s a drop in the bucket. Most appalling is the funding level of the UNHCR. The people who work for the UNHCR and other NGOs are inspiringly committed. What they do with their lives to improve the condition of others is breathtaking and sobering. But they could do so much more with adequate funding. In Gihembe, for example, there are inadequate latrines. It’s a simple problem which requires less than two million dollars to fix. For most of us an individuations, that’s a lot. But for governments and others, it’s chump change. The solution to this crisis is both complicated and simple. Primarily, what we lack is the one most important part of a durable solution: the political will to solve this. If all the stakeholders — especially including donor governments — got serious about this two-decades long crisis, Gihembe camp and the others could be emptied. But for now, we apply bandaids on a gaping moral wound. I should also add that the governments of Rwanda and Kenya have been extraordinarily generous in allowing large camps to be built in their nations. Here some of the poorest nations on earth share previous resources to care for others. Surely this is a widow’s mite. Meanwhile, in the United States, we fund war-making an disgusting levels while claiming we can’t afford to care for the vulnerable. It wouldn’t be hard to write a book about yesterday’s experience alone. I’ll stop here, but I will certainly continue reflecting, mulling, and praying. Among other things, I will think about my own capacity to share financial or other resources with those in need. I will think about my ability as a citizen in the wealthiest nation on earth to advocate for change. And I will think about the church I serve, and I will wonder what response the Gospel commands us to make. Each of the people in Gihembe has a place to sleep and some provision for basic needs (even if inadequate, due to funding shortages). But a shelter is not a home. These children, men, and women deserve a home. And hope. Everyone should also have hope. Photo from flickr user Kresta King, who presumably had the right permits! Well said. Picture good; words better. I’m glad you got a personal encounter with the man-made crisis. 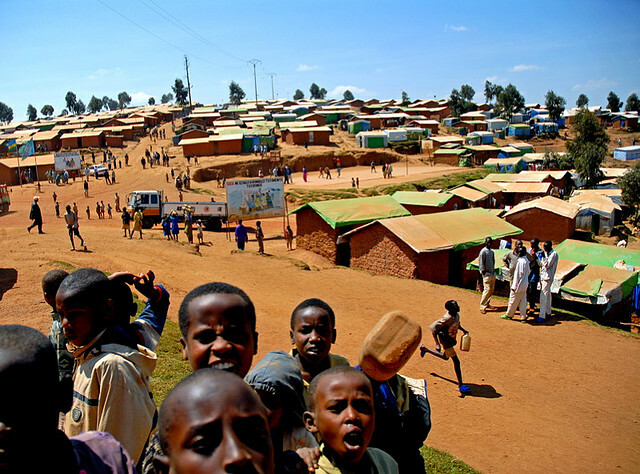 By the way, the largest refugee population is in neighboring Tanzania. You made an important observation that the war making mindset – led by the richest nation in the world – will continue to breed crises after crises until we learn – as the human race – to hammer our swords into plowshares and our spears into pruning hooks. Authentic power is found in peace-making.